like the title states i don't know why i do this to myself. i know i own more than enough make up but the more i watch beauty gurus on youtube and read product reviews i'm just forever wanting to buy more and more products. i didn't even realise when i made this wishlist collage that i've basically put together a whole set of products that would create an entire face look, maybe it's a sign that i should get them all (ha). i've always wanted to try nars sheer glow, there are so many positive reviews out their and the semi-matte finish is so appealing to me... the price tag is not. like my ysl touche éclat foundation i'm always hesitant to buy an expensive high end foundation incase it doesn't work for me. however kayleigh from couturegirl posted a really good review on sheer glow this week so i'm lusting after it again. the benefit event is the reason why i want the most glamourous palette, enough said. there's nothing really to say about the highlight and blush, except the highlight is a cream formulas which is something i don't really use when it comes to face products but i think i want to expand to at least trying them. finally, i must be the only blogger in he world that does not own any of the revlon butters. i have no idea why especially as all i read is co stant positive reviews on them. maybe now is the time to invest, can you recommend any shades to me? you're not the only one that doesn't have the lip butters, I don't! although I keep wanting one and I'm also really wanting to try the Nars sheer glow foundation but know what you mean about not liking it when the price tag is that much! I've heard mixed reviews on the Nars Sheer Glow, you should definitely check out the review on YouTube by Goss Makeup artist. He talks about it quite a lot and it made me give it miss. It may work for you though so let us know how you get on with it! 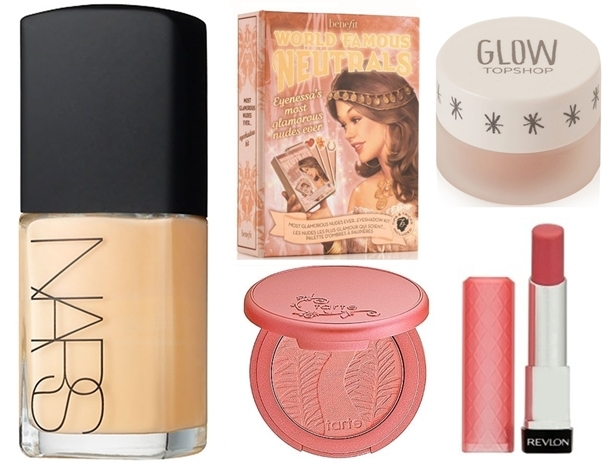 I'm definitely going to have to get Nars sheer Glow, I've wanted it for way too long now! I have two Revlon Lip butters in Strawberry Shortcake and Sweet Tart, I love them both and want to pick up a few more shades! Really want to try the topshop glow! I love the revlon lip butters, I have creme brulee and tutti frutti! Also, I have been debating with myself over buying the Nars Sheer Glow for the longest time but I think I'm just going to get it. I know I will at some point so it may as well be now! I've been lusting after NARS Sheer Glow too! It sounds amazing. I have NARS Sheer Glow and I absolutely love it! It is definitely my go to foundation and so worth the investment. I think you should really go for!! You could also ask at the counter when they match you to a shade about whether you can have a sample to see if it works for you before dedicating to it. I love the lipstick shade! Need to try it out! I want to try all of these! Makeup is my obsession but it's so darn expensive! Reading about the glamourous palette has also made me want it haha! Always wanted to try this foundation too!